Namkar Barzin is the second minister to Dorje Shugden after Kache Marpo. He is one of the newest members of Dorje Shugden’s entourage, whose history goes back to around 60-75 years ago. 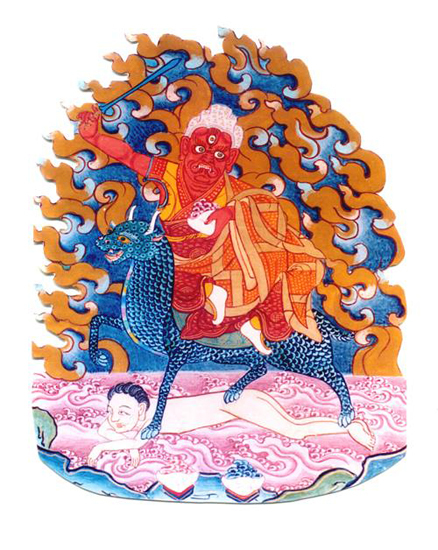 He is not an enlightened being but an oath-bound Dharma Protector, after being subdued as a raging spirit by Domo Geshe Rinpoche and placed under the command of Dorje Shugden. Namkar Barzin was a Mongolian man who traveled from Mongolia to Dungkar Monastery with only one wish, to be ordained as a monk. He was old and poor but still made the effort to travel a far distance to seek solace. Unfortunately, when he arrived at the Monastery, Namkar Barzin was ill treated by the resident monks because he was merely a penniless old beggar. The monk in-charge rejected Namkar Barzin’s request to be ordained and chased him out. This sincere beggar who thirsted for the Dharma so much and whom had nothing else but the Dharma to depend on again requested help from the four monks whom he met outside of the Monastery. However, to his dismay, he was insulted and beaten up by them. At that point, Namkar Barzin became enraged and cursed the monks who ill-treated him that they will all die within a year. Much later, this poor Mongolian man was found dead near a place known as Pema Choling. The nomads who live in that area saw his body and threw it into a river where it got caught in between some rocks for days. The herders nearby who saw Namkar Barzin’s body amused themselves by throwing stones at him and making fun of him. A weird disease erupted and spread, which caused many of the herders and their yaks to fall ill and die, including one of the monks who mistreated Namkar Barzin. The monk eventually died from the terrible disease, and his death was followed by many more deaths. Once, Namkar Barzin even possessed a victim and clearly showed how many more people he was going to kill. A blessing came when Domo Geshe Rinpoche, who was then the abbot of Dungkar Monastery, heard of this bad news and came to subdue this angry spirit. After successfully subduing Namkar Barzin, Domo Geshe Rinpoche made him take an oath to protect Dharma teachings and the area where Dungkar Monastery was situated. His Oracle was established in Dungkar Monastery. Domo Geshe Rinpoche thus put Namkar Barzin under the command of Dorje Shugden as the second minister of Dorje Shugden’s entourage, where he will be able to collect vast merits and benefit countless sentient beings for infinite lifetimes. This deity is well known for having the power to protect buildings, institutions, monasteries, etc. He is especially powerful in protecting Dharma related institutions, not just from material loss due to theft, fires or natural disasters but also loss arising from schisms between members. He does this by promoting harmony between members of such institutions and ensuring everyone has good relationships with one another. Namkar Barzin has one face, two hands, and three bulging eyes. He is red in color and bears a ferocious and proud expression. He wears the robes of an ordained monk and rides on a mythical animal, Gyaling which represents his Tantric attainments. His right hand brandishes a sword which cuts through our problems and obstacles while his left hand holds a skullcup representing his mastery of Tantra. In some thangkas, he also wears a Mongolian turban that is made of red silk. 1. Wojkowitz, Rene De Nebesky. Oracles and Demons of Tibet. 1993. This entry was posted on Tuesday, November 15th, 2011 at 7:56 am	and is filed under Articles. You can follow any responses to this entry through the RSS 2.0 feed. You can leave a response, or trackback from your own site. Wow.This shows that the Protectors listen to the Gurus. It is saddening how the monks of Dungkar Monastery treated Namkar Barzin when he went to the monastery to ask to be an ordained monk. It is even more sad that after he has past away, people mistreat his body. Showing no respect towards the dead at all. With all his anger, I think I understand why Domo Geshe Rinpoche subdued him, asking him to be part of Dorje Shugden’s entourage. It is good that another protector, although unenlightened, helps to protect the Dharma. I think that the role of Namkar Barzin is especially important in today’s society where schisms is very easily created among students of a teacher.